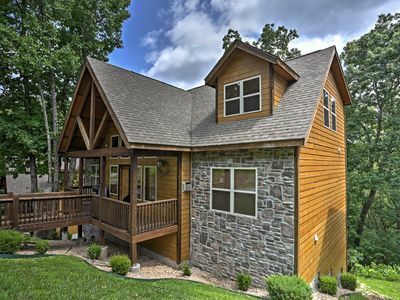 Next to Silver Dollar City and Backs up to Tablerock Lake, Great Community! This is a Walk-In Condo, NO STAIRS, just walk straight in! 2 bedrooms and 2 bathrooms. condo is perfect for the couple who like all the comforts of home when traveling, and prefer to watch television from an easy chair or sofa instead of sitting on the end of the bed in a small hotel room. 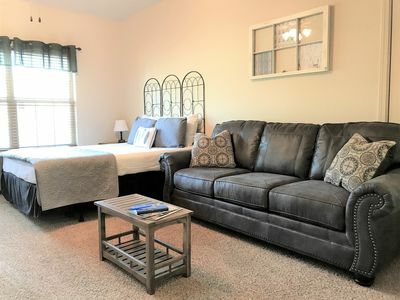 The comfortable double reclining sofa will give you a great relaxing vacation, A 43" flat screen TV is in the living room plus 40" flat screen TV in the Master bedroom and the second bedroom. . ..BUT. . didn't come to Branson to watch TV. . encourage you to explore the region, see lots of shows and attractions. You won't be disappointed in Branson! Yes, the condo has a full kitchen, and you're welcome to purchase your grocery items and do your own cooking. . ..BUT. . 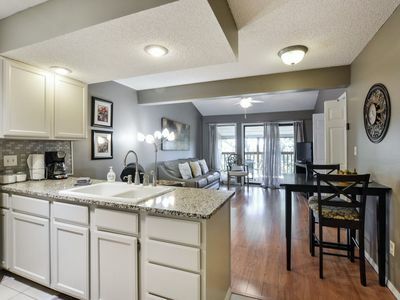 .this condo is close to many great restaurants, so try to take in a few during your stay. A washer and dryer is available inside so you can do a little light laundry and you won't need to pack so many clothes. 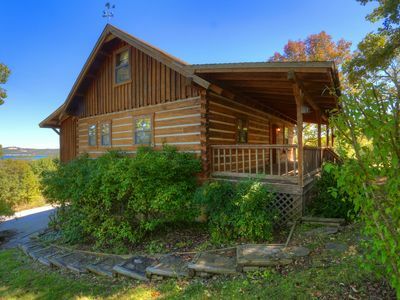 Nestled just 1/4 mile south of Silver Dollar City off of Hwy 76 and really close to all the shows and entertainment attractions. 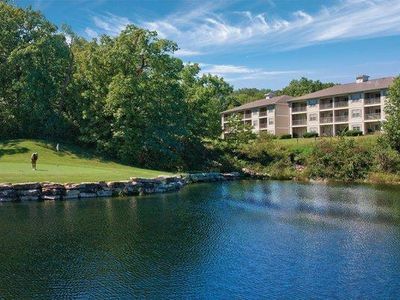 Also, Tablerock Lake is just a few yards behind the condo. Amenities include outdoor pool, hot tub, tennis court, basketball court, playground area. Kansas City—We had a wonderful stay! This condo was better than expected with such wonderful amenities! We loved it! Thank you so much! Definitely will come back! 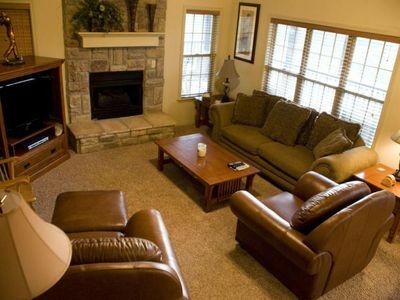 Omaha—The condo was wonderful and made our stay here that much better. Our family loved it better than a hotel. Definitely will recommend it to family and friends. Gary and Renee, Burbank, OK—Thanks for the wonderful little apartment. We always enjoy staying here; it is so beautiful and cozy. Larry and Belinda, Kansas—Appreciate staying at your condo, it was clean and quiet. Pleasure to see the Gideon testament. Kordell and Angelia—Great stay! Nice, Clean and quiet. Thank you! Ron and Robin, Melbourne, AR—Enjoyed the Legends and Liverpool Legends!! Thanks for the clean and neat condo. Matt and Marcie, Peoria, IL—Went to Silver Dollar City and Branson Landing, enjoyed both and really liked the condo. Thanks for the stay! Dillon and Ashley, Oklahoma—The condo was perfect for our anniversary! We absolutely loved the location and feel of the condo! We very much enjoyed the Promised Land Zoo, it was so interactive and well kept. We used a Groupon for the Zoo which made it very affordable. Would definitely recommend it! Wonderful stay! Dan and Ginger, Newalla, OK—Wonderful place, Great value. We will return! We recommend Silver Dollar City, Danna’s Burgers and BBQ and “Sons of Britches” at the Little Opry Theatre at IMAX. 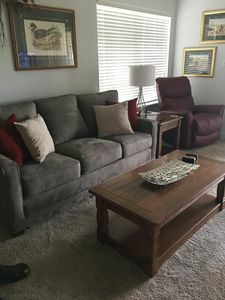 Wood Family--I came across this place on VRBO, for the price I was not expecting much, and was just keeping my fingers crossed that it was at least clean. I was beyond impressed with this place! This place is awesome, clean and I felt safe during my stay. My son and I came to celebrate his 11th birthday. I highly recommend seeing the Acrobats of China, Rich Thomas Magic Show and Silver Dollar City. If you have younger children the wax museum and Hannah’s Maze of Mirrors was also fun. Also, for those who love antiques/crafts, check out the Apple Tree Mall, it’s awesome and plan to spend a few hours there. Anyway, again this place was perfect. I will be recommending this condo to everyone and hope to return soon!! God Bless! 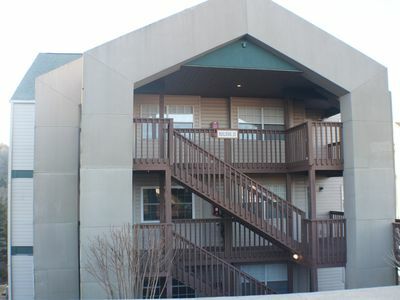 Magnolia, AR--What a great condo for the price range! We could not have found anything nicer that was this affordable. I was very impressed by how clean everything is. My husband and I brought our girls (3 yr and 1 yr) up for our first vacation as a family of 4 and had a super time! 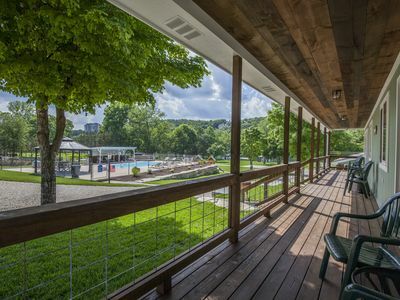 Silver Dollar City is a must for little ones; I will definitely recommend this condo to others and would stay here again if we are able to come back sometime. Thank you. Chad & Donna, Tulsa, OK—We have been coming to Branson/Tablerock for the 4th of July over the last 10 years. My in-laws have time shares at Big Cedar and Grand Crown. However due to the whole family not getting to come this year, we all decided to stay home. At the last minute (July 2nd) my husband and I decided we had to come! 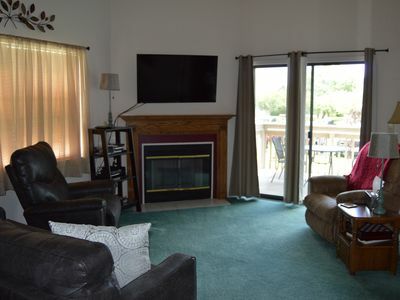 It’s a tradition….so I got on VRBO, and found this GEM! Perfect size for 2! But wow, the pictures did not do it justice! So Clean! We own a cleaning company, so I’m picky! And the décor is just gorgeous! Loved the Turtles! Our kids are grown so we are past the age of go carts and mini golf, and mainly come for golf or the lake. Highly recommend the Slide Boat at State Park Marina! And Spirit of America is fun! If on a budget like we were this year and you want to enjoy the lake, Moonshine Beach is the ticket! Also, Shorty Smalls best food on the Strip and Domino’s has the best $5.99 single topping pizza. Check out Uptown Café for Breakfast Buffet! We really enjoyed our stay! Thanks for sharing your home. 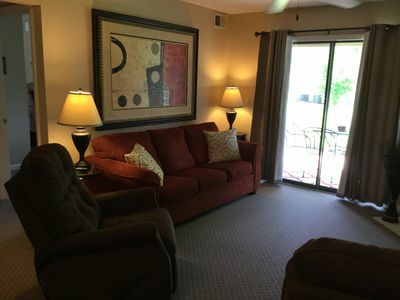 Larry, Tulsa, OK—Very nice condo, clean, excellent location and excellent value. Just right for me and my wife. George was available on the couple of occasions we needed him. Very helpful and cool headed (after WE caused a problem and needed his help). Overall a good experience. Happy to return in the future. 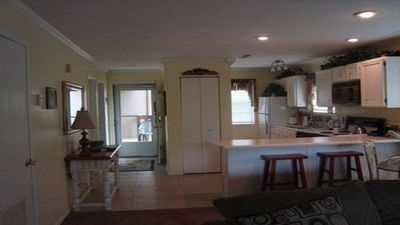 Pointe Royale - WALK-IN LEVEL, 2 NEW RECLINERS, 2 KING BEDS, CLOSE TO POOLS ! 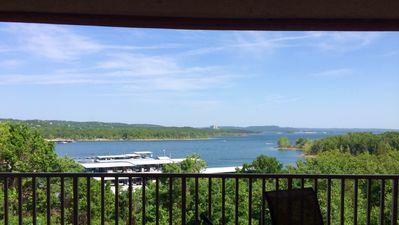 Beautiful LAKEFRONT Condo ** 2 Miles from Silver Dollar City** REMODELED 2016!! 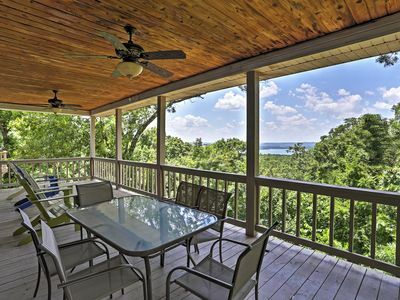 Branson Home w/Comm. Pool+Hot Tub - 1.5 Mi to SDC! 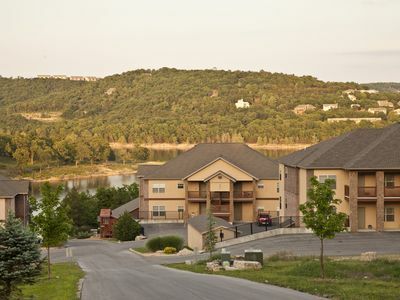 WALK-IN Condo -- Located next to Silver Dollar City!! !